For outdoor/indoor applications. Excellent for Wi-Fi hotspots, kiosks, M2M, IoT, telemetry and vehicle applications. Connect this antenna to existing Wi-Fi routers, access points or other Wi-Fi enabled devices which have reverse polarity SMA external antenna connectors. 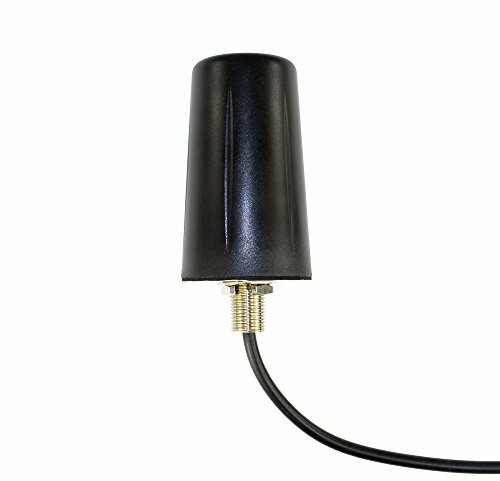 This low profile (~ 3 inches tall) fixed mount omni-directional antenna provides 3 to 5 dBi of gain and supports both the 802.11 b/g/n 2.4 GHz and 802.11 a/ac 5.8 GHz frequency bands. Permanently mounts via a 5/8 in. (16 mm) hole with locking internal nut. Resists vandalism with no exposed coax cable, high impact ABS radome shell and an extra thick threaded screw mounting post. Includes 10 ft of low-loss RG58U coax fed through center mounting post. Includes "L" bracket for optional wall mounting. Integrated RPSMA male plug connector mates with female jack found on most Wi-Fi access points and routers. Note: MIMO systems should have identical antennas on all connectors for best results.